Located in the San Bernardino Mountains, Big Bear Lake is a Popular Destination. Day - Partly Cloudy with a high from 75-82. Night - Partly Cloudy with a low around 48-55. Thunder showers are in the forecast at the end of July and first part of August. FISHING SEASON OPENS EARLY THIS YEAR! Snow showers are in the long range Spring forecast forApril 1-5th. "Share your voice on Yahoo!" Big Bear Lake is nestled nearly 7,000-feet high in the lush San Bernardino Mountains of Southern California, approximately 35 miles east of downtown San Bernardino, California, surrounded by towering mountain peaks and crystal blue skies, lies the largest and most popular fresh water lake in Southern California: Big Bear Lake. A popular "getaway" location for many Southern Californian's, Big Bear Lake offers a wide variety of outdoor activities. Due to its high elevation, Big Bear Lake receives a substantial amount of snowfall during the Winter months. It's not uncommon for the snow depths to reach 3 feet or more in the Big Bear Lake area, and weekends are generally teeming with snow boarders, sledders, and skiers enjoying the fluffy white powder above Southern California's most popular mountain lake. Snow Summit, it's peak at 8,173 feet elevation is a large, fully-functional ski resort at Big Bear Lake, is one of the most popular ski destinations in all of Southern California. 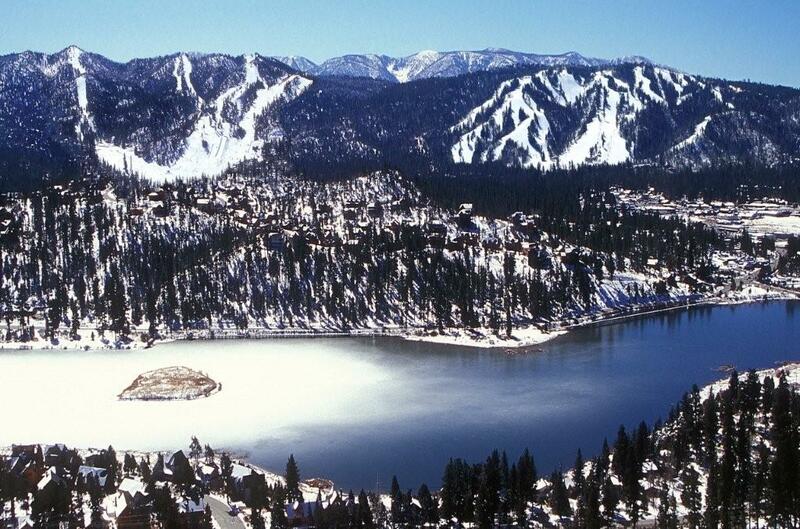 With over 231 skiable acres, 31 trails, and 14 chair lifts, Snow Summit is a major Big Bear Lake attraction. Although the Big Bear Lake area averages over 120-inches of snowfall per year, Snow Summit has state-of-the-art snow making machines that ensure the area is ski friendly well into the Spring. Big Bear's two popular mountain resorts - Snow Summit and Bear Mountain. 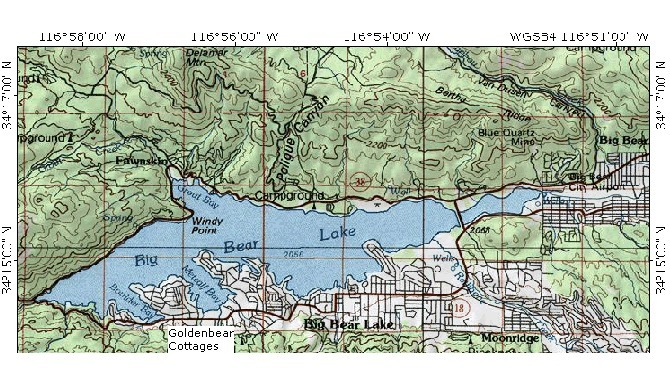 Boating and fishing are two extremely popular activities at Big Bear Lake. With a total length of over 7 miles, and with an average width of over a mile, Big Bear Lake has plenty of surface area in which to enjoy. The lake is routinely stocked with an assortment of fresh water fish: rainbow trout, bass, crappie, bluegill, and catfish. Due to the lake's high altitude and cool waters, an environment that trout flourish in, there have been an assortment of record-setting trout catches over the years. The most popular species of fish found in Big Bear Lake is rainbow trout. Fishing can be done from various areas along the shore or from a number of spots around the lake via boat and/or kayak. Motor boats, paddle boats and jet ski's can all be rented for enjoyment on the pristine waters of Big Bear Lake. If water sports are not to your liking, the Big Bear Lake area offers an assortment of land-based adventures. Hiking, mountain biking and backpacking are by far two of the most popular activities to engage in around Big Bear Lake. 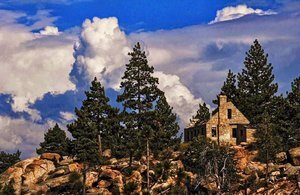 From hiking along the lake's immense shoreline to exploring the various nooks and glens surrounding the lake, hiking and backpacking around Big Bear Lake is an adventure. For the more enthusiastic and bold hiker and backpacker, there are numerous trails leading high up into the surrounding San Bernardino National Forest and San Gorgonio Wilderness, many which offer stunning views of Big Bear Lake and the surrounding forests and meadows. Just south of Big Bear Lake, Mt. San Gorgonio, the highest mountain in all of Southern California at 11,499 ft, is the crown jewel of the San Gorgonio Wilderness. Popular with hikers all over the country, numerous trails traverse the ridges and slopes leading to its summit, and the ambitious hiker is rewarded with a stunning view and the satisfaction of having bested Ol' Greyback as San Gorgonio is often called, the true rooftop of Southern California. Hiking, mountain biking and horse riding are also very popular in Southern California. No matter what your sport or activity of fancy, Big Bear Lake and its surroundings offer an unprecedented array of popular outdoor adventures, lodging and activities. With its crisp, clean air, lush, green forests, and towering mountain peaks, Big Bear Lake is a true cool outdoor paradise! The Big Bear Lake Marketing Association through it's local and regional partnerships is responsible for the development and daily management of 13 websites consisting of lodging, accommodations, resort cabins, boat rentals, family friendly vacations, news and reviews. We daily update over 30 news stories about Big Bear events, discounts and weather. We manage over 2870 web landing pages of discount coupons, lodging and vacation planning. These popular Big Bear sites have over 1360 current photos and 150 links of the drive to the mountains, the four seasons, resort cabin interiors and exteriors, boat rentals and events of local interest on Big Bear Lake: Southern California's most popular mountain lake. Golden Bear Cottages, Receives 2015 Best Place to Stay in Big Bear Lake Award.